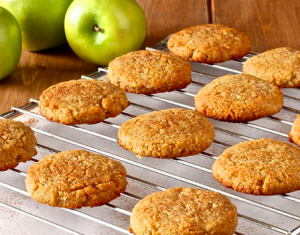 You can feel good about including these nut-free cookies in your kid’s lunch bags. These cookies beat ‘bought’ cookies hands down because they are made from whole grain flour, contain no trans fats, and have very little sugar. And there are 2 whole apples in this recipe! Perfect for an after school/work treat. Preheat oven to 350. Use food processor or Vita-Mix to blend apples into a sauce. Mix together applesauce, sugar and vanilla. Mix flour, salt, cinnamon, baking soda and baking powder in another bowl. Combine wet with dry. Stir in fruit and/or chips. Drop 2 inch mounds on a wax paper lined cookie sheet and flatten with fork. Bake for 10-12 minutes or until firm to the touch. Enjoy!